One of the largest changes to the search marketing landscape in recent years has been the mass adoption of internet capable mobile and tablet devices. What started out as phones designed for contacting each other on the move have themselves evolved into integrated devices which now more closely resemble miniature computers. 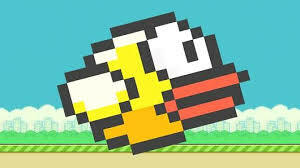 In fact last year we saw mobile search traffic overtake desktop for the first time, with further growth predicted. This blog post has been written to help you get more from your AdWords campaigns with mobile search in mind, but before diving in and making changes to an account it’s worth reminding yourself about the most important goals of the business in question (e.g. a taxi firm is likely to require direct phone leads whereas a coffee shop needs people through the door). While the tips and techniques here might not be suitable for every account, each have their own merits and through the course of experimentation and testing it should be possible for you to achieve a competitive edge with at least some of the information that follows. Mobile bid adjustments to exclude desktop traffic. As there is no longer an option to create mobile-specific campaigns in AdWords it is only possible to build them in a way that encourages mobile clicks while discouraging desktop clicks. This “hack” can be achieved by applying a mobile bid adjustment which is found in AdWords under Settings>Devices. Adjustments can be set anywhere from -100% to +300% depending on what you want to achieve (where a -100% adjustment will prevent mobile ads from showing completely). 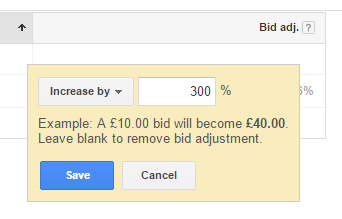 To discourage ads from showing on desktop devices, set the mobile bid adjustment at +300% but remember to reduce your max CPC in AdWords to avoid unintentionally bidding too high! Consider the different intentions of mobile users. Check KeyWord and search query reports often to better understand the needs of mobile users – which may be different from other visitor types. 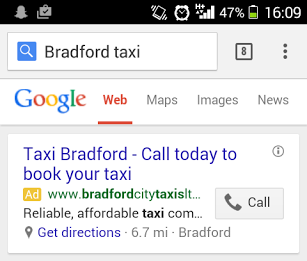 Mobile preferred sitelinks can be put to good effect with this information, further improving the CTRs of your ads. Including a phone number or call button in your ads allows potential customers to make contact instantly and reducing the conversion path to just one click is a big opportunity to improve the performance of your campaigns. Click to call ads show a button while call only ads take this a step further by adding a phone number to the headline copy. Both ad styles allow for phone conversion tracking in AdWords which should always be enabled to get the most from your campaigns. Example of a mobile click-to-call ad. Set up a Google “My Business” page. Linking a “My Buisness” page to your AdWords account will allow you to include a location extension with your ads. This is a great way to let potential customers know where you’re based and you can also bid more aggressively in the immediate area if this is likely to have a positive impact on your ROI. If your site isn’t mobile friendly, you’ll find it much harder to convert traffic from mobile specific ads (and mobile traffic in general). From 21st April 2015 Google will include “mobile-friendliness” as a ranking signal so you can also expect SEO gains if your site is designed with this in mind. To quickly check out the “mobile-friendliness” of any website, you can use this particularly useful tool from Google themselves.